1. Consider purchasing LED lights, which use less energy and run cooler than traditional incandescent lights. 2. Never mount or support light strings in a way that might damage the cord’s insulation. 3. Make sure that cords are not pinched in doors, windows or under heavy furniture, which could damage the cord’s insulation. 4. 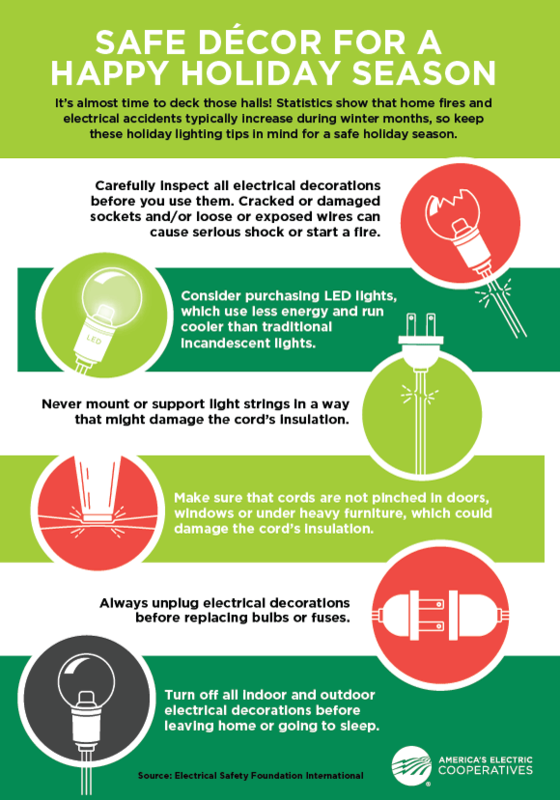 Always unplug electrical decorations before replacing bulbs or fuses. 5. Turn off all indoor and outdoor electrical decorations before leaving home or going to sleep. Never mount or support light strings in a way that might damage the cord’s insulation. Make sure that cords are not pinched in doors, windows or under heavy furniture, which could damage the cord’s insulation.